When photographer Tim Coffey moved to North Carolina a few years ago, he was looking for a unique way to explore his new home state. This desire gave birth to his Carolina Works project. For the project, Coffey visits manufacturing plants around North Carolina to take pictures and interview employees about their jobs. He then posts the pictures, along with a quote about how they do business, on his blog. One of the reasons that Coffey chose the project is that he doesn't have a background in manufacturing. By visiting manufacturing plants around North Carolina, it not only gave him an opportunity to explore the state, but he could also learn a lot about an important industry that he didn't know much about. Another reason he chose to focus on manufacturing plants is because, he would see large manufacturing buildings but he had no idea what goes on inside of them. Plus, he wanted to photograph North Carolinians who work in manufacturing because he said that a lot of the time when someone hears news surrounding American manufacturing jobs, it is usually that jobs are leaving the country. However, what Carolina Works shows is that America is dotted with manufacturing plants that are part of a larger mosaic of industrialized America. So far, Coffey has visited 15 manufacturing plants. 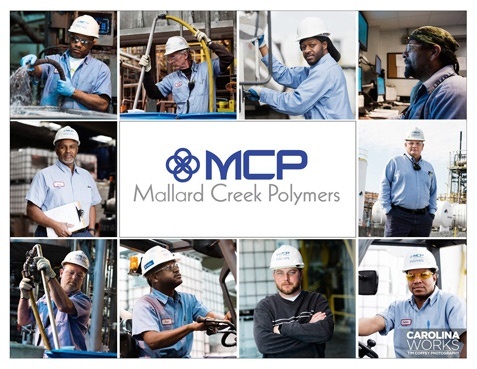 In February 2017, he visited Mallard Creek Polymers (MCP) in Charlotte. MCP is a specialty polymer manufacturer that produces water-based emulsions including styrene butadiene, acrylic, styrene acrylic, and other specialty latexes. Their products are then used in markets such as adhesives, nonwovens, paint & coatings, graphic arts, printing & packaging, textiles, carpet, sealants, construction, oil services, and paper. Coffey said that the first thing that they focused on was safety and then he got a tour of the manufacturing facility. While he was on his tour, he met many staff members and snapped pictures of them while they worked. Coffey said that their specialty polymers manufacturing methods are too complicated for a lot of laypeople to understand, himself included, but he also said that the real world applications of their products weren't lost on him. For example, he learned that something as common as paint needs certain chemicals or it won't work effectively. So while the scientific aspects are difficult to understand, he thought that the real world applications of their products in our everyday lives is fascinating. He also felt that their type of manufacturing ties into his project because Mallard Creek Polymers is a great example of how the manufacturing industry works. The manufacturing industry is like a giant machine, and it's made up of a bunch of working parts that many people aren't aware of. 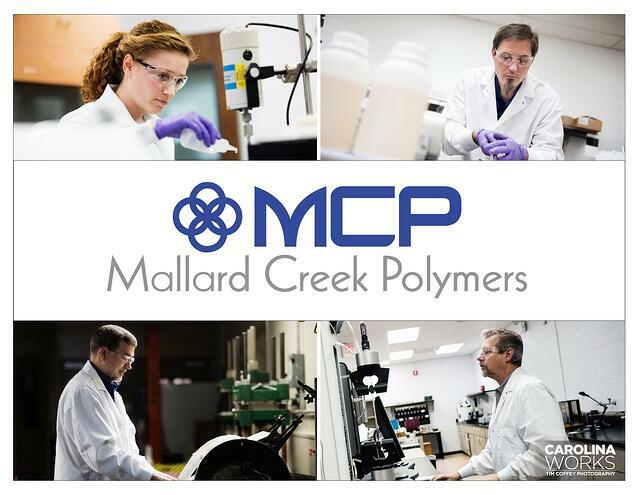 Mallard Creek Polymers is one of those cogs that create products, specifically specialty polymers, for companies who make common everyday products that many people may not know use specialty polymers, like paper, paints and coatings, textiles, adhesives, and nonwovens. Something else that came across during his visit was the employees' dedication and their enthusiasm for their work. He noted how many employees, no matter how long they had worked there, showed the utmost respect to each other and the workplace has a family-like atmosphere. One conversation that left an impression on Coffey was with an employee who talked about her days in school when she didn't really find chemistry to be all that interesting. But then she had chemistry class with a special teacher who showed her how fascinating chemistry can be and what the real world applications are. She hopes in the future, more students are also inspired to get into a STEM career (science, tech, engineering, and math) because new people with fresh perspectives are needed in those fields all the time. Which brings us back full circle to Coffey's Carolina Works - it's about looking at something common that you may see every day, and then exploring it in a unique way that it gives you a new understanding and perspective.